You’ve shot and edited a gorgeous 360 video. Hurrah! Before you begin uploading to Vimeo, we recommend taking a look at the following requirements for your 360 video source file so we can make it look as beautiful as possible. Projection type: All 360 video uploaded to Vimeo should be equirectangular. The image should resemble a 3D sphere flattened onto a 2D rectangular: think of a spherical object (the planet! ), mapped onto right-angled coordinates (e.g., a giant poster in geography class). Source type: You can upload monoscopic or stereoscopic 360 video to Vimeo. 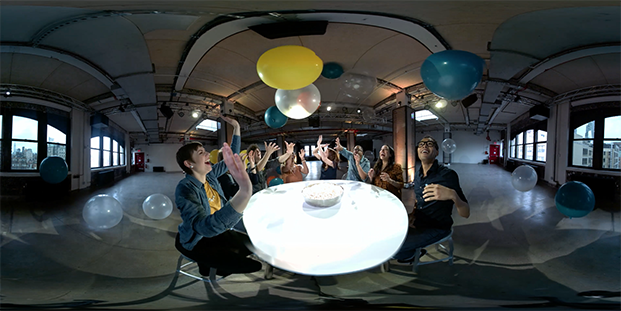 Monoscopic 360 video is filmed using one camera per field of view from one single point of view, and all videos are later stitched together to form one equirectangular video. 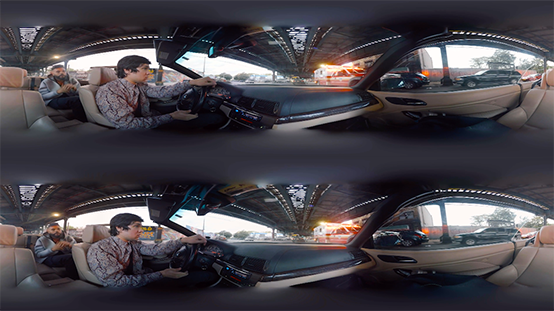 For stereoscopic 360 video, Vimeo supports the top/bottom layout. These types of sources include two equirectangular videos, one on top of another, contained within the same file. The left/right layout for stereoscopic video is not supported and cannot be rendered as 360 within the Vimeo player. Resolution: We support upload and playback for videos up to 8K. Aspect ratio: We recommend a 2:1 aspect ratio for 4K monoscopic 360 video. For 4K stereoscopic 360 video, we recommend a 4:1 aspect ratio for each of the two equirectangular images stacked on top of each other, so that combined image has a 2:1 aspect ratio. Audio format: Vimeo supports standard mono and 2-channel stereo audio, and we recommend stereo for the best playback experience. All source files containing spatial audio will be converted to 2 channel and will not adjust as the viewer moves. We plan on supporting spatial audio in the near future. Metadata: During upload, we’ll detect the settings of your 360 video to the best of our robots’ abilities based on the metadata of your source file (projection type, audio format, etc.). You’ll see dismissable error notifications on your video page and video settings if we pick up on something in your source file that may not be supported. Most cameras and editing software don’t include metadata by default for 360 video. We recommend using either Spatial Media Metadata Injector or Premiere Pro’s VR video settings to inject metadata into your source file before upload. If neither of these options are available to you, don’t worry. Vimeo doesn’t require your source file to have 360 metadata attached, and if it doesn’t, we’ll default to the most common 360 video settings: a monoscopic format and a stereo audio source. After you initiate your upload, you have the ability to edit your video’s title, description, privacy, and other basic settings. You also have the option to mark your upload as 360 by visiting the Distribution > Subtitles tab of your video settings page. After turning on the "Recorded in 360" setting, you’ll be given the option to select monoscopic or stereoscopic (top/bottom layout) from the drop-down menu. Make sure to hit the "Save" button before you leave the settings page. The selection of monoscopic or stereoscopic does not determine how your viewers will enjoy your video (that’s based on their own preference and headset situation). This setting is about your source file and will help us render everything just as you intended based on how you recorded your 360 video and stitched it together. If you do not select a source type, we’ll automatically default to monoscopic. If you’ve already injected 360 metadata into your video file (using Premiere or another spatial media injector), our robots can detect this and select all the necessary options for you. From your video’s settings page, you can customize further with advanced settings for 360 and embed settings. Video settings: 360 video settings can be adjusted by navigating to the Distribution > Subtitles tab of your video settings page. If you incorrectly marked your video as 360 on the upload page, simply deselect “Recorded in 360” and save your changes to return to normal playback. Advanced 360 settings: To set the field of view and default orientation for your video, click Advanced 360 settings below “Recorded in 360” on the Distribution > Subtitles tab of your video settings. Field of view (FOV): Choose the boundaries of the frame in Field of View (FOV), which you can set between 30-90 degrees (50 degrees is the default). This is the portion of video that is visible by the viewer at any given point. It’s similar to a zoom effect without technically magnifying your video. Default orientation: Enter the exact coordinates for your pitch and yaw. Pitch tilts up or down, while yaw moves from side to side. This determines what “forward" means for your video, or the exact point in space your video begins. These settings only apply to the desktop viewing experience, and do not apply when your 360 video is experienced in the Vimeo mobile apps (with or without a headset). Embed settings: If you’re a Vimeo Premium, Business, PRO, or Plus member, you have access to even more control of the 360 embedded video player. Under the Embed tab of your video settings, there’s now an option to disable the 360 badge and the compass (gyroscope). These settings are checked by default and can only be removed in the embedded player, not on vimeo.com. Thumbnail: The default thumbnail for your 360 video is captured from the un-rendered video file. The aspect ratio of the on-site Vimeo player is cinema wide (21:9) for 360 video, so we recommend uploading a thumbnail for your video in the same aspect ratio, unless you intend to embed your 360 video in a player with different dimensions. You can upload 360 videos using your mobile device. If you don’t inject the 360 metadata before you upload, you’ll need to access the video settings from a tablet or desktop computer to set your video as 360. This also applies for uploads through third party apps that use the Vimeo API (e.g., Dropbox). Vimeo PRO, Business, and Premium members can use the video review page to share their 360 video quickly and securely. The review page’s in-video notes are not currently supported for 360 video and will be disabled automatically.